For the sixth straight year, University of Arizona Law students topped Arizona State University in the Jenckes Closing Arguments Competition. This year’s event was the 45th meeting between the two schools and took place Friday, Nov. 13 at the ASU campus in Tempe. Arizona Law now leads the series 29-17. Jim Carlson (above, left) and Matthew Ashton (above, right) represented Arizona Law in this year’s competition. The team prepared with Professor Tom Mauet (above, center), the country’s leading trial technique expert and Jenckes coach for the last 35 years. Ashton says working with Mauet made all the difference. Two weeks before the showdown, each team receives a partial transcript of an actual court case. It includes witness testimony and evidence but does not include closing arguments. The students use the facts of the case to formulate their own closings, then argue against the other team before a judging panel of up to 40 trial attorneys who are members of the Arizona chapter of the American College of Trial Lawyers. The judges are not told which school competitors attend. The winning streak underscores Arizona Law’s rich tradition in civil justice, as highlighted in the new Civil Justice Initiative, which aims to help Arizona Law elevate the American civil justice system and become the premier destination for civil justice research and educating trial lawyers. Ashton says the experience was an important part of his legal education and laying the foundation for his career. 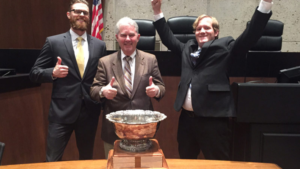 The coveted Jenckes Cup will once again reside in the Arizona Law library until next year’s competition, which will take place in Tucson.